Now that we have taken care of your facial skincare routine, it’s time to turn our attention to the rest of your body. There is a lot of skin to cover and it can be difficult to find the time to take care of your body (and the motivation). This is the final post in the “How to Build a Skincare Routine” series. Here I will be breaking down what you should be doing for your body skin and some different ways to take care of the skin on your body. If you missed the facial skincare part of this series, see our posts on the best skincare routines for dry skin, oily skin, and combination skin. First things first you’ve got to keep your body clean! Body wash is an easy item to just grab from the drugstore. Normally we grab the cheapest one or the one that smells the best, but you actually want to take a better look at the label. It is best to find products that help to solve skin issues. There are many different types of body wash, you have hydrating ones, exfoliating, and anti-acne which is great for tackling the dreaded bacne. 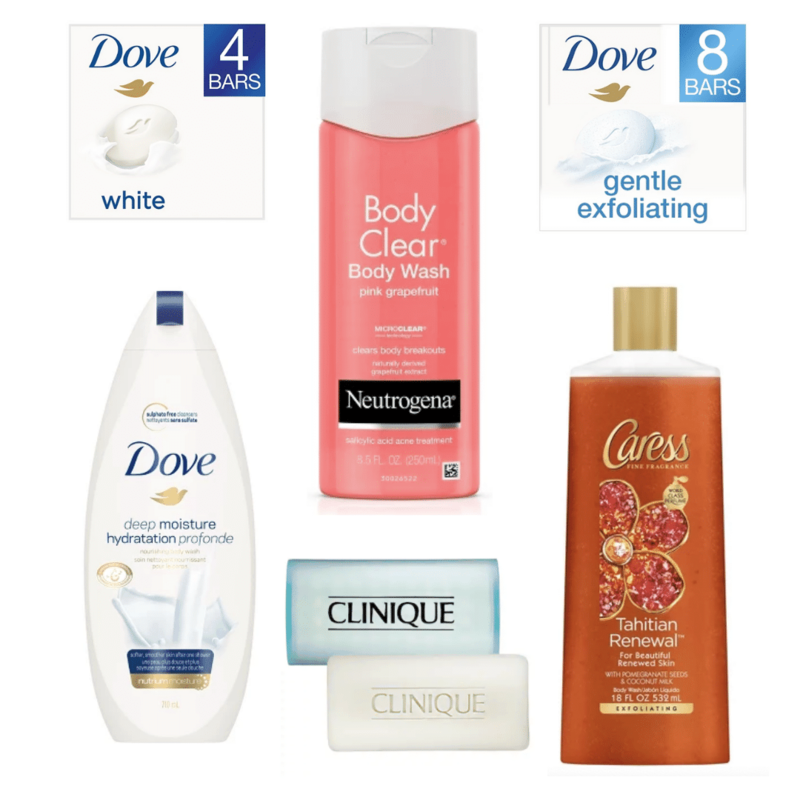 A great hydrating body wash option is the Dove Deep Moisture body wash or their traditional beauty bar, both of which are packed with moisturizing ingredients. For an exfoliating body wash option, Caress has a great one that uses pomegranate seeds to exfoliate (make sure to stay away from any plastic beads in your exfoliating products as they’re horrible for the environment and now banned many places) and it does double duty because it contains coconut milk to nourish the skin. If you are a bar soap fan, the Dove gentle exfoliating soap is a great option for both exfoliating and moisturizing as well. For body acne, the Neutrogena body clear wash is a classic option. It is loved by many for its clearing abilities due to the inclusion of salicylic acid. Plus this wash has a lovely citrus scent, so you get the best of both worlds. If you’re looking for a bar soap option, Clinique offers a clearing bar soap that not only clears your breakouts but is also gentle enough to use on your face. Exfoliating your body is beneficial for a variety of reasons. Exfoliation helps to slough off dead skin, free ingrown hairs, and helps to keep your skin feeling super soft. There are a few different ways to exfoliate. You can use a body scrub like many do or you can use a tool. Here again you can stick with Dove who has a line of body scrubs including a rice milk and crushed macadamia product that will help to exfoliate and moisturize the body. 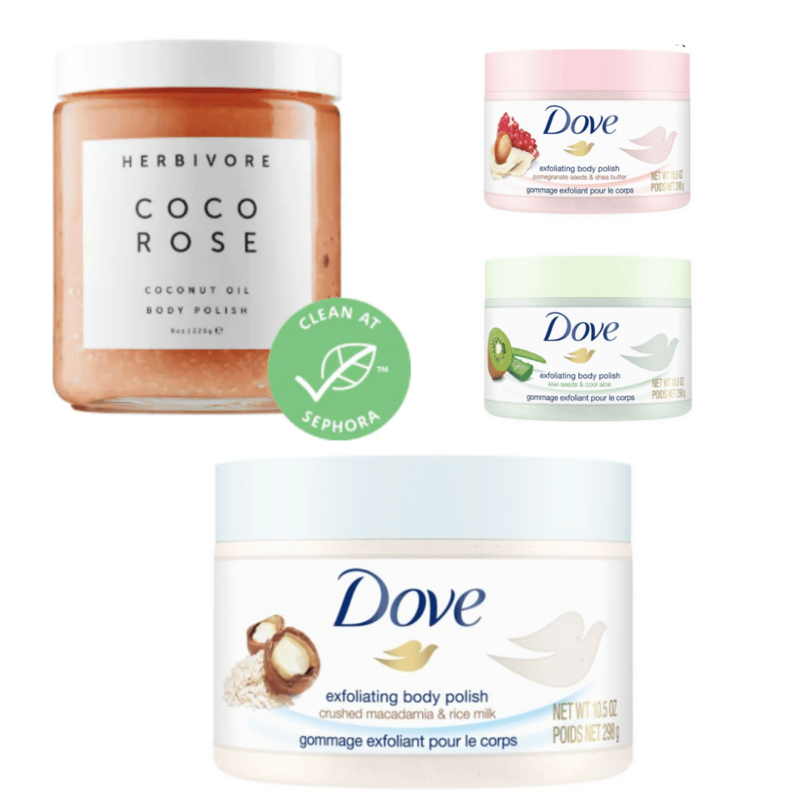 Another product that is loved by many is the Herbivore Coco Rose body scrub. It smells amazing and is a sugar-based scrub. A sugar scrub is my personal preference because it will dissolve slowly on your wet skin which helps to prevent over exfoliation. If you prefer to DIY your body scrubs check out this article for two different body scrub recipes. You can also try different tools that will exfoliate your body. 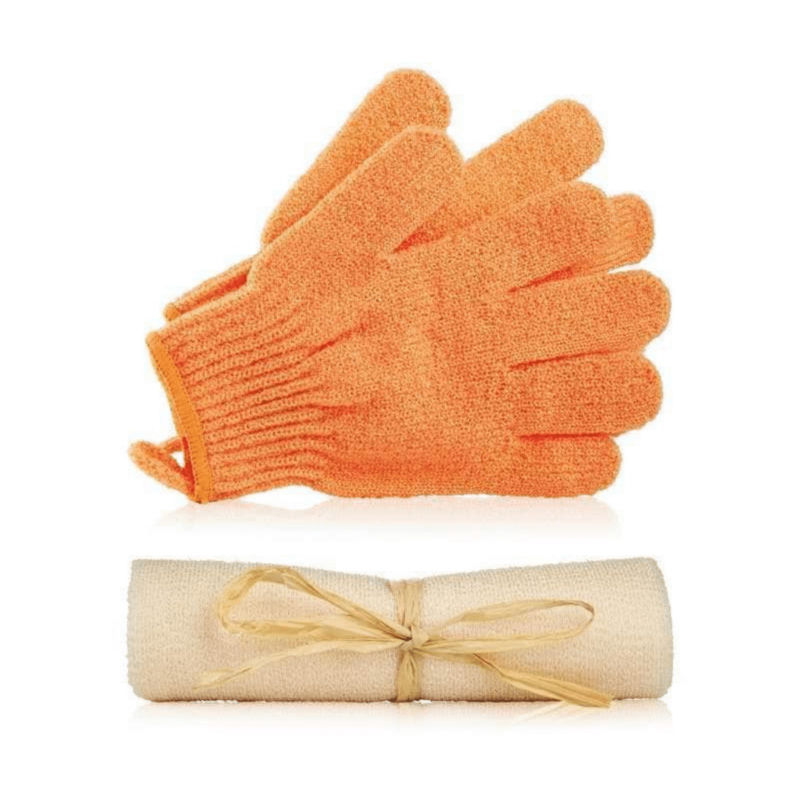 I love using The Body Shop’s exfoliating gloves, I have even replaced my loofah with them because they’re gentle enough for everyday use. I use them with a bar soap so that I can also reduce my carbon footprint (because it takes more energy to ship body washes that have water in them). And for the days when you want a deeper scrub or you have difficulty reaching your back, the body polisher is a great product. It is just a long strip of an exfoliating material so you can grab it from both ends and get those hard to reach spots on your back. What I love about both of these products is that you can throw them in the wash so they end up lasting much longer than a loofah. Moisturizing your body is just as important as moisturizing your face. But moisturizing your whole body can be tiresome and take up some time. If you’re a bit lazy like I am I would suggest using an in-shower moisturizing option. This way you don’t have to be very neat and if you don’t rub a bit in well enough, it will just be wiped off with your towel instead of it ruining your clothes. While in-shower moisturizers are great, a traditional body cream is really great for in between showers or even a great way to incorporate a moment of self care into your routine. There are also many more options for this style of moisturizer and if you struggle from very dry skin you may want to use both types. 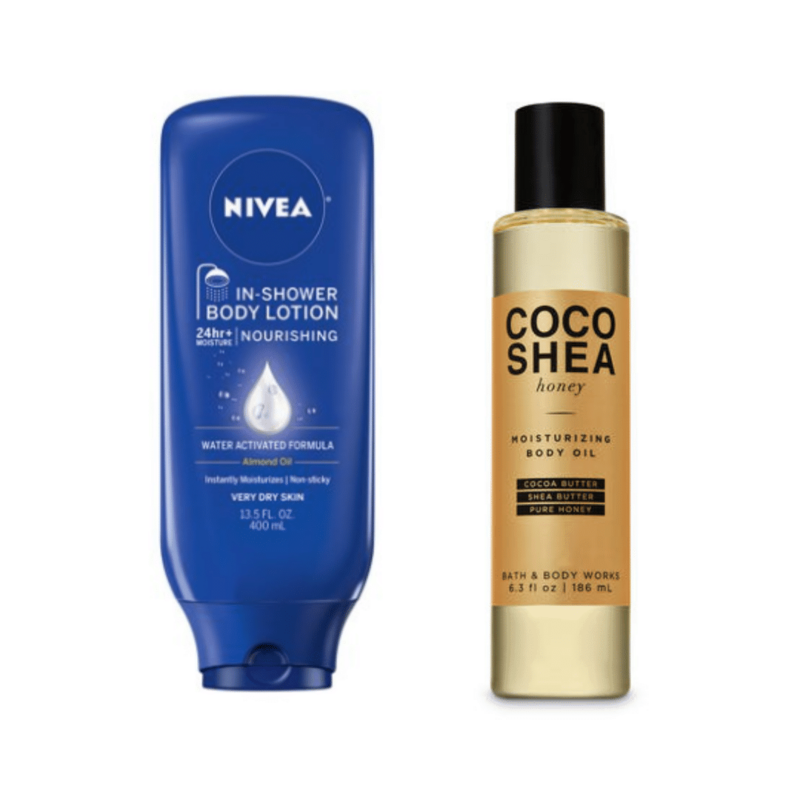 Nivea’s in-shower body lotion is a great product. It is made for dry to very dry skin (but anyone can use it, it’s just extra moisture!) and it is super simple to use as well. Just apply it to the skin. No intense rubbing is necessary as it is a water-activated formula, meaning it is naturally sucked into the skin. Then rinse off the excess product. Another option that I love to use in the shower is a body oil. Because oil is hydrophobic you don’t have to worry about it being washed down the drain instead of being sucked into your skin. One of my favorites is the body oil from Bath and Body Works’ Coco Shea line. it absorbs quickly and comes in multiple scents. Caution: you should only be using in-shower moisturizers if you have a textured bathtub floor or rubber grips. All in-shower moisturizers make the floor very slippery if you do not have extra grip. There are a ton of affordable body moisturizers on the market including some with very fun textures, and it’s up to you what texture and scent you enjoy. 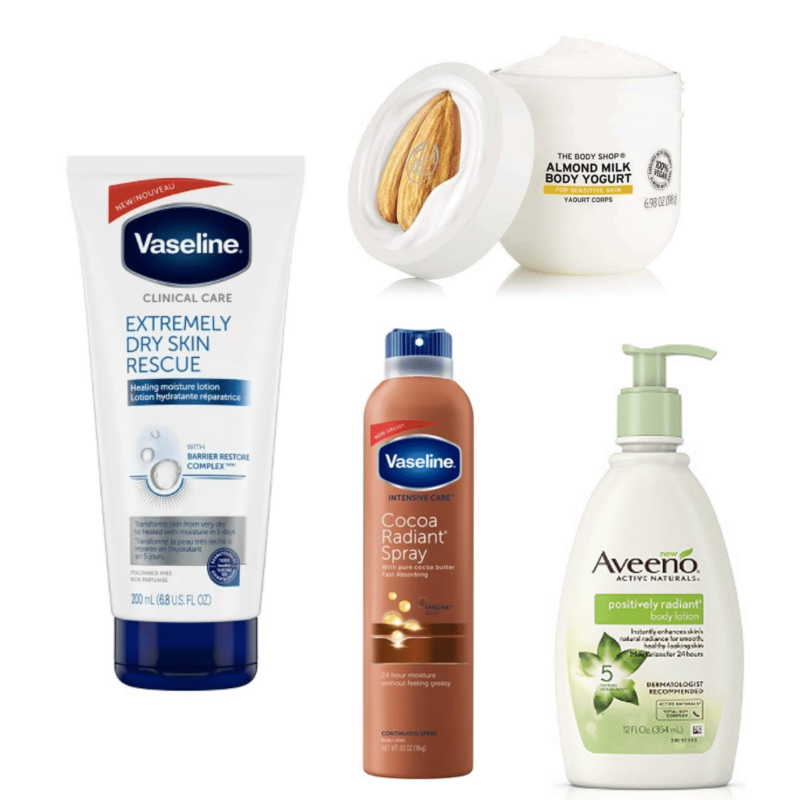 But for some simple and hydrating products the Vaseline Extremely Dry Skin Rescue was rated the best moisturizer for sensitive skin by Allure in 2018. A lighter option is the Aveeno Positively Radiant lotion which not only moisturizes your skin but also keeps it looking bright and radiant. And if you want to speed up the process a bit you can opt for a spray on moisturizer, like this one from Vaseline. And of course you can absolutely use a body oil outside of the shower as well. When you are taking a bath, add some of your body oil into the water. Your skin will be so soft when you get out! When prepping for the summer season, try out Boscia’s Baby Soft Foot Peel! It uses acids to break the bonds between your dead skin and you new skin so within a week the whole dead bottom of your foot will peel off. You want to make sure that you are wearing socks the whole time so that the dead foot skin doesn’t get everywhere. If you want to have a really lovely bath but don’t want to pay for a fancy bath bomb, try the recipes in this article to create your own fancy bath soak. Still have questions? Let me know below! Have you tried any of these products? Or do you have your own holy grail body products?